As any audiophile would attest, constantly discovering new music is essential. Stumbling upon a new artist – a diamond in the rough – is exhilarating. But sometimes it’s not easy. iTunes and Spotify’s recommendation engines are good, but quick to run through. They don’t change often enough. And especially with iTunes, genres are oversimplified – metal and rock artists overlap, and you can’t delve much deeper in the many sub genres. That’s why I was elated to discover the web tool Every Noise At Once. 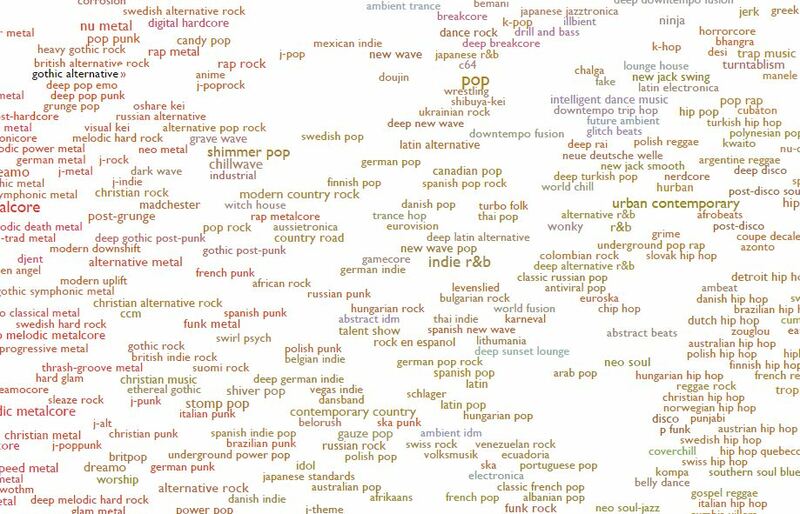 The site is an ongoing attempt at an algorithmically-generated, readability-adjusted scatter-plot of the musical genre-space, based on data tracked and analyzed for 1385 genres by The Echo Nest. The calibration is fuzzy, but in general, genres or artists list further “down” on the page more organic, “up” are more mechanical and electric; “left” are denser and more atmospheric, “right” is spikier and bouncier. Click anything on the page to hear an example of what it sounds like, and then click the » on a genre to see a map of its artists. It’s endless music discovery. And much like YouTube or Wikipedia, where you can quickly go down the rabbit hole of content discovery, you can do the audio equivalent using Every Noise At Once.